AC01 Guitar Capo, Capo from Rotosound. Rotosound are launching their new spring loaded Guitar Capo designed to be used with one hand for quick changes whilst playing on stage. 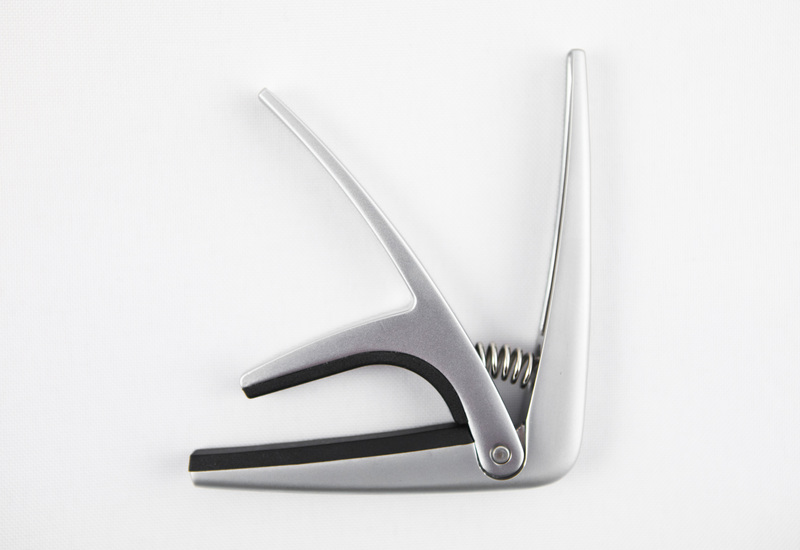 Made from Magnesium alloy the Guitar Capo is designed to be small and light. According to Rotosound, it is easily applied and removed by squeezing it into place. Rotosound AC01 Guitar Capos are designed for various types of guitar players, from flamenco, to Irish Traditional music, folk and blues and rock. To find out more or to purchase visit www.rotosound.com. Rotosound ATC-10 Guitar Tuner & Chord Finder Rotosound adds the new Guitar Tuner/Chord Finder to its selection of guitar accessories. IK Multimedia StealthPlug CS Custom Shop Guitar and bass players can use two new packages from IK Multimedia: The StealthPlug CS and StealthPedal CS "Custom Shop" Systems. Malekko Heavy Industry Plus Ultra 213 Malekko Heavy Industry, purveyor of effect pedals and synthesizer modules, announces the Plus Ultra 213 is now shipping.